Metastatic breast cancer (MBC) prognosis is variable, depending on several clinical and biological factors. A better prediction of a patient’s outcome could allow for a more accurate choice of treatments. The role of serum biomarkers in predicting outcome remains unclear in this setting. Tau, a microtubule-associated protein, is a neuronal marker that is also expressed in normal breast epithelial cells and cancer cells. Its tissue expression is associated with prognosis in MBC. However, the prognostic value of Tau serum levels in these patients is unknown. We aimed at evaluating the prognostic value of Tau (and other classical biomarkers) in MBC patients, and to assess its association with the presence of brain metastases (BM). 244 MBC patients treated at our institution (2007–2015) were retrospectively selected. The usual MBC clinical and pathological variables were collected, altogether with CA15–3, CEA and HER2 extra-cellular domain (ECD) serum levels. Tau serum levels were measured with a novel immunoassay (digital ELISA) using Single Molecule Array (Simoa) technology. Overall survival (OS) was estimated with the Kaplan-Meier method. To investigate prognostic factors, a multivariate analysis was performed. Cut-offs were set using the Youden index method associated with receiver-operating characteristics (ROC) curves to evaluate the accuracy of biomarkers to identify patients with BM. With a median follow-up of 40.8 months, median OS was 15.5 months (95%CI 12.4–20.2). Elevated serum levels of Tau were independently associated with a poor outcome in the whole population as well as in patients with (n = 86) and without BM (n = 158). Median serum Tau levels tended to be higher in patients with BM (p = 0.23). In univariate analysis, patients with BM had an increased risk of serum Tau > 3.17 pg/mL (OR = 2.2, p = 0.049). In multivariate analysis, high values of Tau (OR = 3.98, p = 0.034) accurately identified patients with BM in our cohort. The survival of metastatic breast cancer (MBC) patients has improved over the past decades with the use of new therapeutic agents . However, the outcome remains poor, with a median overall survival (OS) of 21 to 30 months [1, 2]. MBC survival ranges from a few months to decades depending on various factors [4, 5]. Given this great variability in terms of outcome, probably reflecting the biological heterogeneity among MBC , a better evaluation of a given patient’s prognostic factors could allow a more accurate choice of therapeutic strategy. To date, several clinical and biological prognostic factors have been reported, including patients’ characteristics (age and performance status), previous medical history (prior chemotherapy [CT] for MBC treatment) and disease extension (number and location of metastatic sites) [4–6]. Tumor biology (including hormone receptors [HR] and Human Epidermal growth factor Receptor 2 [HER2] expression) is also a cornerstone of patients’ prognosis. HR-positive tumors have been associated with a better outcome, and with response to hormone therapy [4, 7, 8]. Regarding the HER2 status, series published in the pre-trastuzumab era have demonstrated a negative prognostic value of HER2 amplification in MBC . Since trastuzumab introduction, however, this effect has been reversed and HER2 amplification has been associated with a better outcome in recent series [5, 10]. High Lactate Dehydrogenase (LDH) and low albumin serum levels have also been reported as poor prognostic factors in MBC in several studies [11–13]. The role of serum tumor markers in predicting outcome remains unclear in patients with MBC. 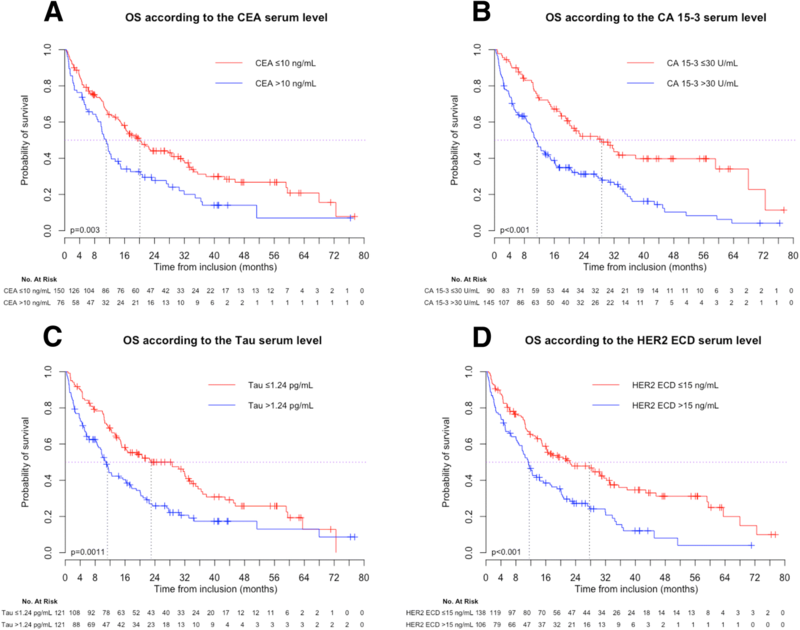 High Cancer Antigen 15–3 (CA 15–3) and Carcinoembryonic Antigen (CEA) serum levels seem to be associated with a poorer survival [14–17]. The prognostic value of serum HER2 extra-cellular domain (ECD) has been shown in MBC patients, whatever the HER2 status of the primary tumor, high serum HER2 ECD levels being associated with a poor outcome [17–19]. Considering the recent interest in phenotypic changes and tumor heterogeneity during breast cancer progression, other biomarkers have been evaluated as prognostic factors in MBC patients . In a study from our team in 250 MBC patients, high serum levels of Neuron Specific Enolase (NSE) and Matrix Metalloproteinase 9 (MMP-9) were associated with poor prognosis in univariate but not in multivariate analysis . The Tau protein, a microtubule-associated protein, is involved in the microtubule stabilization and polymerization. It is mainly localized within the central nervous system (CNS) (mostly in neurons and also in glial cells [20, 21]); its expression has been reported in several cell and tissue types including normal breast epithelial cells  and cancer cells [23, 24]. Matrone et al. found that Tau expression is increased in metastatic tissue compared with primary breast cancer cells . Tau expression in tumor tissue has been inconsistently associated with response to taxanes, microtubules-stabilizing agents used in the treatment of breast cancer patients [24, 26]. High Tau protein expression was associated with a more favorable prognosis in breast cancer and MBC in several studies [24, 27]. However, the prognostic value of the serum levels of the Tau protein in cancer patients and more specifically in MBC patients has not been investigated. Considering the different levels of Tau expression between localized and metastatic BC tissues, a circulating evaluation could represent a more accurate evaluation of the MBC cells content and allow a minimally invasive evaluation. Mainly a neuronal microtubule-stabilizing protein, Tau has been associated with several neurological conditions. Indeed, it plays a major role in the pathophysiology of Alzheimer’s disease (one of the most common “tauopathy”), through its accumulation in a hyper-phosphorylated form (P-Tau). It accumulates (in neurons and/or glial cells) in other neurodegenerative disorders and is released (T-Tau form) in the extracellular matrix and cerebrospinal fluid (CSF) after neuronal damage. Elevated T-Tau CSF levels are found in Alzheimer’s disease  and in other diseases such as fronto-temporal dementia , multiple sclerosis , or following stroke . T-Tau serum levels were also studied in stroke  and head traumas [33, 34], and seem associated with the extent of the brain damage . T-Tau thus seems to be a biomarker of neuronal and axonal damage. Despite the fact that brain metastases (BM) are responsible for such damage, CSF or serum T-Tau levels have never been evaluated in this setting so far. Of note, a study on pediatric primary brain tumors revealed that T-Tau CSF levels were significantly higher in these patients compared with controls . In another study, CSF T-Tau levels were found significantly higher in pediatric patients with leukemia-related leptomeningeal involvement . The aim of the present study was to evaluate the prognostic value of several serum tumor markers, namely CA15–3, CEA, T-Tau and HER2 ECD in a series of MBC patients. Also, breast cancer being the second most common cause of BM, we assessed the association of T-Tau serum levels with the presence of BM in MBC patients. We conducted an exploratory, retrospective, monocentric study on MBC patients treated at our institution between 2007 and 2015 using a previously reported clinico-biological database [17, 38]. The primary objective was to evaluate the prognostic value of serum biomarkers (namely, CA 15–3, CEA, Tau and HER2 ECD) in patients with MBC and in the subpopulation of patients with BM. The secondary objective was to analyze the association of serum levels of Tau with the presence of BM. MBC patients were retrospectively identified by reviewing the medical records of MBC patients from our institution database between 2007 and 2015. Inclusion criteria were as follows: patient ≥18 years old; histologically-confirmed MBC; availability of the HR and HER2 statuses of the primary tumor; and availability of a frozen serum sample performed at the metastatic phase, for biomarker determination. Patients with history of other invasive cancer(s) were excluded. In order to allow the analysis of the secondary objective regarding the association between serum Tau levels and the presence of BM, and the prognostic value of Tau in patients with BM, our MBC population was enriched with patients diagnosed with BM, as previously published . In this subpopulation of patients, the eligibility criteria were: intraparenchymal BM diagnosed on imaging; availability of a frozen serum sample performed at the time of BM diagnosis (+/− 15 days); and absence of leptomeningeal metastases associated with BM. Patient with BM were matched to patients without BM by age (< 50, 50–70 or > 70), tumor biology (four BC biological subgroups: triple-negative [TN], HR+/HER2-, HR+/HER2+ and HR-/HER2+) and number of previous metastatic treatment lines (0, 1 or 2, > 2). Clinical and biological data were collected by reviewing the medical records of the selected patients: demographical, clinical and biological data (histological grade of the primary tumor, HR and HER2 statuses). The tumor was considered HR-positive when more than 10% of cells were labeled in immunohistochemistry (IHC) or when the concentrations of estrogen (ER) and progesterone receptors (PR) using the radio ligand binding method were above 10 ng/mL and 50 ng/mL, respectively. The tumor was considered HER2-positive if the primary tumor was scored 3+ by IHC or if the HER2 gene was amplified by fluorescence or chromogenic in situ hybridization (FISH/CISH) for IHC 2+ cases. For cases with HR and/or HER2 status changes over time, the biology used was that of the most recent sample. For cases of synchronous or asynchronous bilateral cancer with discrepant HR and/or HER statuses, the most unfavorable biology was used: higher histological grade, HR-negative, HER2-negative (trastuzumab era). The brain imaging with contrast enhancement performed at the time of BM diagnosis (magnetic resonance imaging, MRI or, if not available, CT-scan) was collected for patients with BM in DICOM (Digital Imaging and Communication in Medicine) format. The number of BM was determined by a retrospective review of the imaging by AD. BM volume was calculated on post-contrast sequences (T1 sequences for MRI) using the Osirix® software v7.0.2 (Pixmeo, Bernex, Switzerland). For multiples metastases, the volume was calculated as the sum of the volumes of each BM. The selected serum samples were extracted from the Biological Resources Center of our institution (Biobank number BB-0033-00059) (samples processed within one hour and stored at − 80 °C in serum aliquots). The biologists performing the analyses were blinded to the study endpoints. HER2 ECD serum levels were measured by ELISA using commercially available ELISA assays (Nuclea Diagnostic Laboratories kit, LLC) according to the manufacturer’s instructions. The analysis of T-Tau serum levels was performed with a novel immunoassay (digital ELISA) using Single Molecule Array (Simoa) technology (Tau Simoa 2.0 Assay Kit, Quanterix, Lexington, MA, USA) as previously described . Based on singulation of enzyme labeled immune-complex on paramagnetic beads, this assay is associated with a limit of detection of 0.02 pg/mL. Therefore, this method is claimed to be approximately 1000-fold more sensitive than the conventional immunoassay. All samples were analyzed diluted 4-fold with the diluent provided in the kit (phosphate buffer with bovine serum and heterophilic blocker solution) to minimize the matrix effects. The Tau Simoa performances were evaluated and validated within the laboratory by measurement of serum samples (n = 72) in duplicates, intra- and inter-assay variations over 10 runs using the low and high quality control (QC) samples provided in the kit. An internal QC of pooled serum sample was included in each experiment (10 runs). As MMP-9 serum level was associated with the presence of BM in a previous study published by our team , it was measured by ELISA using commercially-available ELISA assays (Human MMP-9 Quantikine Kit, R&D Systems, Minneapolis, MN, USA). For MMP-9, a duplicate analysis was performed, but no duplicate analyses were deemed necessary for the other biomarkers. Other biological parameters, including CA 15–3 (ELSA-CA15–3 Cisbio assays, Gif sur Yvette, France) and CEA (Elecsys CEA test, Roche Diagnostics, Meylan, France), had previously been analyzed for clinical purposes and were collected. As we evaluated the prognostic value of biomarkers, the manuscript adheres to the REMARK guidelines . Categorical variables were reported: number of missing data, number and percentage for each variable modality. For continuous variables, number of missing data, mean, standard deviation, median and range values were computed. OS delay was measured from the date of the serum sample to the date of death from any cause. Patients alive without events were censored at the closing date of the study analysis (March 30th, 2015). OS was estimated according to the Kaplan-Meier method, and presented as medians with their 95% confidence intervals (95% CIs), and survival rates in percentages, with 95% CIs . The median duration of follow-up was estimated using a reverse Kaplan-Meier method and presented with its 95% CI. The following cut-offs were used to investigate the prognostic value of the biomarkers: 15 ng/mL for serum HER2 ECD , 30 U/mL for CA15–3 and 10 ng/mL for CEA. As there is no validated cut-off for T-Tau in MBC patients, different cut-offs (quartiles, mean) were tested to investigate its prognostic value in the whole population and in patients with BM. To investigate prognostic factors, a multivariate analysis was performed using the Cox’s proportional hazards regression model with a stepwise procedure. Hazard ratios with their 95% CIs were calculated to display risk changes. Cut-offs were set using the Youden index method associated with receiver-operating characteristics (ROC) curves to evaluate the accuracy of biomarkers to identify patients with BM . To evaluate the correlation between Tau serum levels and BM volumes, the median values of serum Tau were calculated for tumor volumes < 10 cm3, ≥10 cm3 and non-measurable disease (cases with a high number of small BM) and compared with the Kruskal-Wallis test. All p-values reported were two-sided, and the significance level was set at 5% (p < 0.05). Statistical analysis was performed using the STATA 13.1 software (Stata Corporation, College Station, TX). This study was reviewed and approved by the local Institutional Review Board. Considering the retrospective, non-interventional nature of this study, no additional consent was deemed necessary. A total of 244 women with MBC were included in the study. The clinical and biological characteristics of patients at baseline are presented in Additional file 1: Table S1. Median age at the time of the serum sample was 58.3 years (range 26.4–87.2). The most represented histological subtype was ductal carcinoma in 83.8% of cases. Tumor biology was distributed as follows: HER2+/HR+ in 25.0%, HER2+/HR- in 23.8%, HER2-/HR+ in 25.4% and triple negative in 25.8% of cases. 29.0% of patients presented with synchronous metastases at first diagnosis of breast cancer (M1). The metastatic-free interval (MFI) was over 24 months for 54.1% of patients. At the time of the serum sample, the median number of previous CT lines was 1 (range 0–9). Among 119 patients with a HER2-positive tumor, 83.2% of patients had received a previous anti-HER2 treatment. A majority of patients had at least four metastatic sites (58.6%). Only 17 patients (7.0%) had only bone and/or subcutaneous metastases. Most patients showed a good performance status (ECOG status ≤2 in 90.7%). Albumin serum level was available for 153 patients and was low in 23 cases (15.0%). Serum LDH level was high in 44.8% of the 87 cases with a reported value. The characteristics of the subpopulation of patients diagnosed with BM (n = 86) are described in Additional file 1: Table S1 and S2. Brain was the first metastatic location in 15 patients (17.4%). 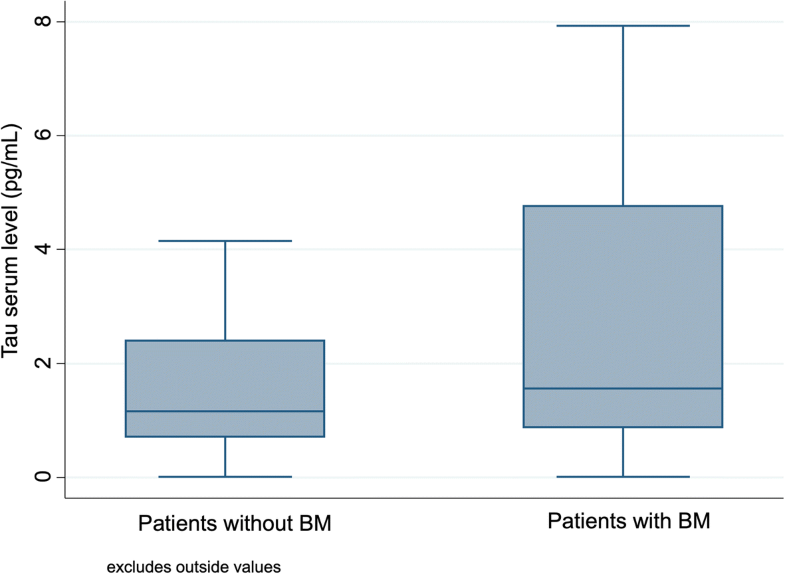 The number of BM was one BM in 20.9%, 2–3 in 18.6% and ≥ 4 in 60.5% of patients. The median BM volume (available for 65 cases) was 7.1 cm3 (range 0.1–55.3), 0-10 cm3 in 53.8% of the cases, >10cm3 in 33.8% and non-measurable in 12.3% (eight cases with a high number of small BM). BM location was strictly supratentorial in 20.9%, strictly infratentorial in 15.1% and both supra- and infratentorial in 64.0%. Patients were asymptomatic at BM diagnosis in 34.9% of cases. 45.3% of symptomatic patients presented with intracranial hypertension symptoms, 44.2% with a sensory-motor and/or language deficit, 8.1% with epilepsy and 4.7% with disturbed vigilance. The distribution of BM patients according to the modified breast Graded Prognostic Assessment (modified breast GPA) prognosis score [43, 44] was as follows (n = 78): 3.5–4 in 9.0% of cases, 2.5–3 in 38.5%, 1.5–2 in 29.5% and 0–1 in 23.1%. A localized treatment (surgery or radiosurgery) was performed in 18.6% of cases: surgery in 8.1% (n = 7, with adjuvant radiotherapy except in one patient) and radiosurgery in 10.5% (n = 9). Whole-brain radiotherapy was the most frequent treatment and was performed in 47.7% of the cases. 23.2% of the cases received systemic treatment only, and 10.5% only best supportive care. The median time interval between the first MBC diagnosis and blood collection was 13.9 months for the whole population (14.1 months in the BM group compared with 13.8 months in patients without BM, p = 0.78). Regarding the Simoa approach, the Tau assay evaluation data showed a coefficient of variability (CV) lower than 13% for the Tau serum replicates. Intra and inter assay variations of low and high QC exhibited CV of 3.5 and 13% respectively. The use of an internal QC of pooled serum sample showed intra and inter assay variation with CV of 10.2 and 14% respectively. The median serum biomarker levels were: 37.5 U/mL (range 8.0–1988.0) for CA 15–3, 4.0 ng/mL (range 1.0–5122.0) for CEA, 1.24 pg/mL (range 0.0–755.5) for T-Tau, 14.0 ng/mL (range 2.8–280.0) for HER2 ECD, and 333.80 ng/mL (range 38.7–2051.0) for MMP-9. The ROC curves for serum Tau, HER2 ECD and MMP-9 and were calculated to evaluate the ability of each biomarker to identify patients with BM (data not shown). Using the Youden index, the thresholds were calculated as follows: 3.17 pg/mL for Tau, 12.70 ng/mL for HER2 ECD and 245.78 ng/mL for MMP-9. The proportion of patients with high serum levels is presented for each biomarker in Additional file 1: Table S1. Serum CA 15–3 (cut-off 30 U/mL) and CEA (cut-off 10 ng/mL) were elevated in 60.2 and 33.6% of the 226 patients with known values. Serum Tau was elevated in 23.4% of patients, serum HER2 ECD in 57.4% and serum MMP-9 in 69.7% of patients, respectively (with the cut-offs defined using the Youden index method). Table 1 summarizes the median and mean values of the studied biomarkers in patients with BM and patients without BM. In patients with BM, the median delay between BM diagnosis and serum sample was 0 days (range − 14 to + 15 days). The distribution of Tau serum levels in patients with and without BM is presented in Fig. 1. Median serum Tau levels were higher in patients with BM (1.56 pg/mL compared with 1.16 pg/mL in patients without BM) but this difference did not reach significance (p = 0.23). In univariate analysis, patients with BM had an increased risk of serum Tau > 3.17 pg/mL (OR = 2.2, 95%CI 0.9–5.2, p = 0.049). They also had an increased risk of serum HER2 ECD > 12.70 ng/mL (OR = 4.2, 95%CI 2.0–9.3, p < 0.001) and MMP-9 > 245.78 ng/mL (OR = 3.4, 95%CI 1.5–8.3, p = 0.001). In multivariate analysis, high values of Tau (OR = 3.98, p = 0.034) accurately identified patients with BM in our cohort of all MBC patients, as well as high values of HER2 ECD (OR = 7.26, p = 0.001), MMP-9 (OR = 4.69, p < 0.001) and CEA (OR = 2.71, p = 0.030), and low values of CA 15–3 (OR = 3.05, p = 0.031). The median values of serum Tau were 1.85 pg/mL (range 0.01–427.3) for tumor volumes < 10 cm3, 1.24 pg/mL (range 0.22–751.1) for tumor volumes ≥10 cm3 and 1.57 pg/mL (range 0.06–17.6) for non-measurable disease (p = 0.82). At the time of the analysis, 69.7% of patients had died, mostly because of MBC progression (88.2%). This proportion was significantly higher when considering patients diagnosed with BM (90.7%, p < 0.0001). With a median follow-up of 40.8 months (95% CI 31.1–43.6), median OS was 15.5 months (95% CI 12.4–20.2). In patients with BM (median follow-up 40.9 months, 95% CI 28.2-NC), median OS was 9.7 months (95% CI 5.6–10.8), compared with 30.4 months (95% CI 16.8–34.5) in patients without BM (p < 0.0001). The 1-year and 2-year survival rates in the entire population (n = 244) were 57.1% (95% CI 50.5–63.1) and 38.2% (95% CI 31.8–44.6), respectively. Table 2 and Additional file 1: Table S3 summarize the variables significantly associated with prognosis in the univariate analysis in the entire population. Among the tested biomarkers, high levels of CEA (p = 0.003), CA 15–3 (p < 0.001), Tau (p = 0.0011, cut-off corresponding to the median, 1.24 pg/mL) and HER2 ECD (p < 0.001) were also poor prognostic determinants in univariate analysis (Fig. 2). The prognostic significance of the serum level of Tau remained true whatever the cut-off used: first quartile (0.74 pg/mL, p = 0.007), third quartile (3.17 pg/mL, p < 0.001) or mean (18.70 pg/mL, p = 0.035). A multivariate analysis was performed (n = 210), excluding albumin due to a high number of missing data. The patient’s age at the time of the serum sample, ECOG performance status, presence of BM or subcutaneous metastases, number of previous metastatic CT lines, tumor biological subtype, high HER2 ECD, high CA 15–3 and high Tau serum levels were independently associated with poor prognosis (Table 3). 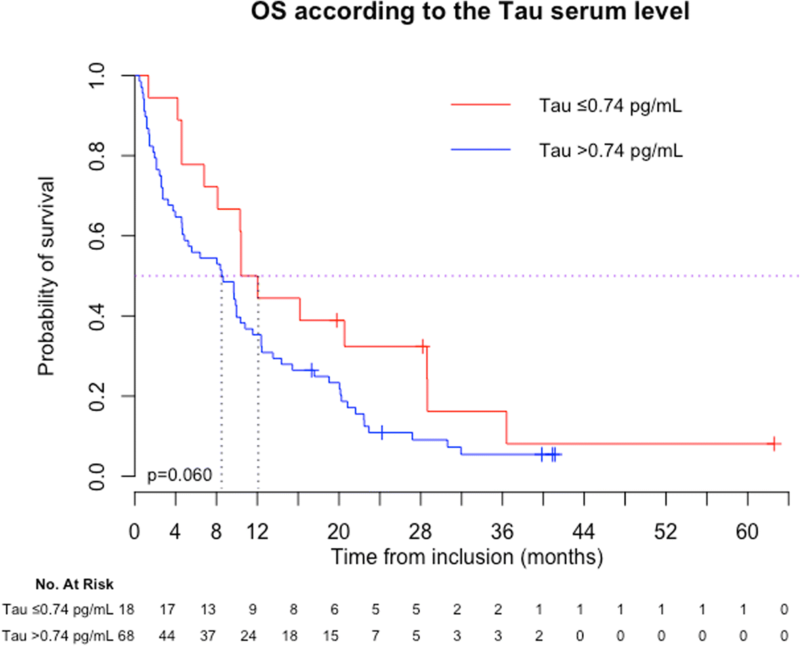 These results, in particular those regarding the prognostic value of the Tau serum levels (p = 0.016), were unchanged when the tumor biology was categorized in three groups (HER2+, HER2-/HR+, and triple-negative tumors) instead of four. The variables significantly associated with poor prognosis in univariate analysis in patients with BM (n = 86) are presented in Table 2. Among the tested biomarkers, only high serum Tau level showed a trend (p = 0.060, using the first quartile cut-off) towards an association with prognostic in univariate analysis (Fig. 3). A multivariate analysis was performed (n = 78), excluding serum proteins and albumin due to a high number of missing data. The patient’s age at the time of the serum sample, ECOG performance status, presence of subcutaneous metastases, tumor biological subtype and the presence of a neurological deficit associated with BM were independently associated with poor prognosis. Among the tested biomarkers, high serum levels of HER2 ECD and Tau were independently associated with a poor outcome (Table 3). In this series of 244 MBC patients, we found an association between Tau serum level and the presence of BM. In univariate analysis, patients diagnosed with BM had an increased risk of having a higher Tau serum level. This was confirmed in multivariate analysis: Tau serum level was independently associated with the presence of BM (OR = 3.98, p = 0.034). However, the results of our multivariate model must be considered with caution as, quite surprisingly, the relation of CA 15–3 serum level with the presence of BM was inversed, patients with BM having an increased risk of having a lower CA 15–3. To our knowledge, this is the first report of such a correlation between Tau serum level and the presence of a brain tumor. So far, only one report has been published of an association between the levels of Tau in CSF and brain tumors in pediatric patients [36, 45], while several reports of correlations with Tau have been published for other non-neurodegenerative disorders, including traumatic brain injury (TBI) [34, 33] and stroke . In TBI, the serum level of Tau was associated with the presence of macroscopic lesions detectable on brain imaging, and with the patients’ clinical outcome . Tau was also associated with the clinical severity and the infarct volume in stroke patients . In our study, there was no correlation between the serum levels of Tau and the BM volume measured on post-contrast imaging, in contrast with data reported in TBI or stroke. Several hypotheses can be discussed to explain this finding. First, we chose to measure BM volume on post-contrast imaging (measurement of the enhancement), therefore we did not take into account the surrounding edema that could also cause neuronal damage. Moreover, measures were performed on images from various devices (CT-scan, MRI), which could also be a source of bias. Second, the correlation analysis was limited by the relatively reduced number of patients with measurable BM. Of 86 patients with BM, imaging was available in DICOM format for 65 patients only. Among them, 8 presented with a high number of small BM, not accessible to BM volume calculation. Finally, it is possible that there is really no correlation between Tau and BM volume. Our data suggests an association between the serum levels of Tau and the presence of BM in MBC patients. However, due to the limitations of our multivariate model and to the absence of correlation with BM volume, this result needs to be confirmed. To our knowledge, this study is the first report of an association between the serum levels of Tau and survival in MBC patients. However, a few studies have evaluated the prognostic value of Tau expression in tumor tissue in breast cancer [24, 26, 27]. Indeed, Tau expression seems to be higher in MBC compared to that reported in early breast cancer . In 102 patient-matched primary and metastatic samples, Tau expression was found in 26 and 52%, respectively. The prognostic value of Tau expression in tumor tissue has been suggested in several studies , including one performed in 54 patients treated with paclitaxel and cisplatin as first-line chemotherapy for locally-advanced or metastatic breast cancer . High expression of Tau was associated with longer OS in the whole population of breast cancer patients as well as in patients with MBC. This prognostic advantage could be linked with an increased microtubule stability, leading to less aggressive tumors. Of note, a predictive value of Tau expression in tumor tissue for the tumor response to taxanes has been inconsistently reported in metastatic or early breast cancer . For the first time, the prognostic value of Tau serum level was also found specifically in the subpopulation of patients diagnosed with BM. So far, only few studies have reported a prognostic impact of Tau measured in CSF, but not serum, in brain tumors. Indeed, CSF Tau was elevated in pediatric patients with CNS malignancies compared with pediatric patients without CNS . Other studies have evaluated the prognostic impact of Tau measured in serum and non-tumoral neurological disorders such as TBI  or stroke . The mechanisms underlying the prognostic impact of Tau serum levels in MBC patients need to be clarified. First, it could be hypothesized that it results from the enrichment of our population with patients diagnosed with BM. Indeed, Tau is a known biomarker of axonal damage. As discussed before, our data suggests an association between the presence of BM and elevated serum values of Tau, and Tau seems predictive of OS in MBC patients with BM. 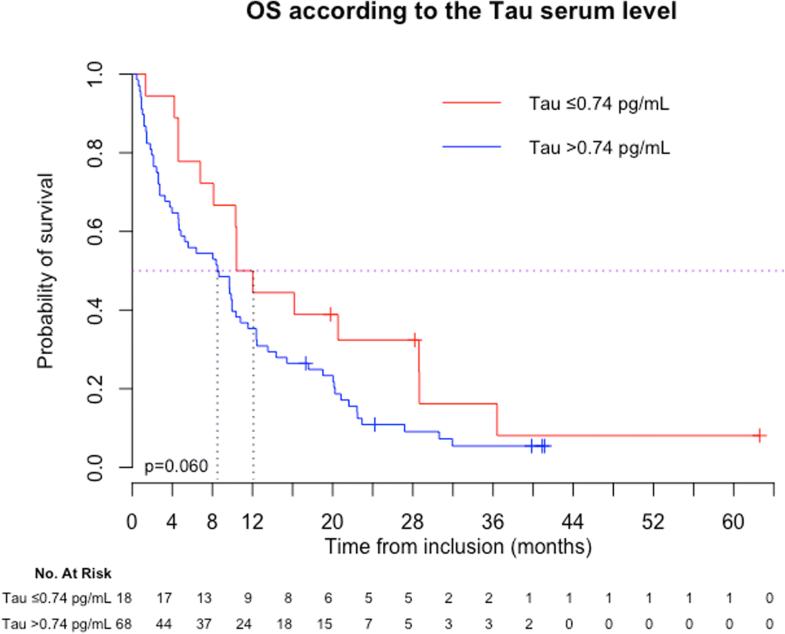 Therefore, our MBC population being enriched with BM patients, the prognostic value of Tau could be a result of its association with OS in BM patients. To test this hypothesis, we analyzed survival in the subpopulation of patients without BM (n = 158) to see if serum Tau remained associated with OS. High serum level of Tau was indeed associated with poor OS in univariate and multivariate analysis (data not shown, median OS 14.4 vs. 34.9 months, p = 0.004, using the median value of Tau as a cut-off). Therefore, the prognostic value of serum Tau does not seem to be limited to patients with BM. Additionally, the prognostic impact of Tau in the whole MBC population remains significant in multivariate analysis, independently of the presence of BM. One could argue that BM might have been undiagnosed in a proportion of our patients, since no systematic brain imaging is performed in the absence of symptoms at our institution, and BM incidence has been reported to be higher in pathological series (18% of patients ) than in clinical series (5.1% ). However, in asymptomatic patients with BM, one would expect small BM volumes, responsible for only slight neuronal damage. Other mechanisms independent of brain damage could also be involved. In further exploratory analysis, we found a significant association between serum HER2 ECD and serum Tau (Pearson correlation coefficient 0.182, p = 0.004). One could thus argue that HER2 ECD mediates the prognostic impact of Tau. Indeed, its poor prognostic value in MBC patients was demonstrated . Moreover, the MAPT gene (encoding for the Tau protein) and the ERBB2 gene are closely located on the 17q21 chromosome, and could be co-amplified. However, we found no correlation between the presence of HER2 amplification and the serum value of Tau in our patients. Of note, the inverse prognostic value of serum Tau compared with its tissue expression could be linked to the fact that these two analyses do not measure the same thing. While the tissue expression of Tau seems to favor the integrity of microtubules (and thus improve the prognosis), the release of Tau in serum reflects tissue damage (not only in the brain but also in other tissues such as muscles, vessels, kidney…). Our study is based on a well-characterized series of MBC patients and brings new data on the prognostic value of the Tau protein serum levels. Nevertheless, it has some limitations. Due to its retrospective nature, we could not avoid missing data, in particular for classical biological parameters such as LDH or albumin. Moreover, because we chose to enrich our population with patients diagnosed with BM as to allow the analysis of the association between serum Tau levels and the presence of BM and the prognostic value of Tau in patients with BM, our population may not be entirely representative of a routine MBC population. In particular, there is in our series an over-representation of patients with a HER2-positive tumor. Regarding the Simoa approach, we reduced the variability by measuring the samples in batches and using a single reagent lot. The levels of Tau detected were above the limit of quantification, which ensure the quality of the result. The Tau Simoa assay showed low assay variations for the serum samples replicates with CVs lower than 10% in accordance with the laboratory’s criteria of immunoassay evaluation (CV < 20%). It is possible however that the delay of storage of the sample impacts the measure, but this possible bias is present for the all population and cannot account for the differences observed. Finally, we acknowledge that our results need to be confirmed in an independent cohort. Performing a cross-validation procedure to validate our data was unfortunately not possible due to the relatively limited number of patients in the BM group. In conclusion, the Tau protein is a new biomarker of interest in MBC. Its serum level seems to represent an independent prognostic factor in these patients (both in patients with and without BM). Tau serum level also seems to be associated with the presence of BM in this population. A validation of these results in an independent set of MBC samples is necessary to confirm these findings, in particular because of the inversed behavior of CA 15–3 serums levels with the presence of BM. Further confirmatory studies are mandatory. The authors wish to acknowledge Dr. Hélène de Forges for editing the manuscript. This work was conducted with the financial support, as grants, of the GEFLUC (Groupement des Entreprises Françaises dans la Lutte contre le Cancer) Languedoc-Roussillon, and of the SIRIC Montpellier Cancer (grant “INCa-DGOS-Inserm 6045”). Both funding sources had no role in the design of the study, the collection, analysis and interpretation of data or the writing of the manuscript. AD conceived the study, identified the patients, collected medical information, analyzed the results and drafted the manuscript. CH conceived the study, carried out the analyses for serum Tau, analyzed the results and helped drafting the manuscript. ST participated in the design of the study and performed the statistical analyses. AM performed the Tau analyses and helped drafting the “Material and Methods” part of the manuscript. AG participated in analyzing the results and drafting the manuscript. EC carried out the analyses for serum MMP-9, participated in analyzing the results, and helped drafting the manuscript. HDF participated in analyzing the results and drafting the manuscript. NF and SG participated in analyzing the results and drafting the manuscript. WJ conceived the study, analyzed the results and helped drafting the manuscript. SL carried out the analyses for serum Tau, participated in analyzing the results, and helped drafting the manuscript. All authors have read and approved the final manuscript. This study was reviewed and approved by the Montpellier Cancer Institute Institutional Review Board. Considering the retrospective, non-interventional nature of this study, no specific consent was deemed necessary by the clinical research review board of the Montpellier Cancer Institute.